"You don't sell opera like a pair of jeans," opera director Denis Krief was quoted as saying last week as he reacted to the latest advertising campaign from Italy's La Scala. The posters plastered across Milan use a mixture of blood and gore to attract a younger audience. La Scala spokesman Carlo Maria Cella says it is a plan which is working: "Every theatre has to cultivate a renewal of its audience. As someone wrote: new blood for the old ceremony." Attracting new audiences is the perpetual problem for an art form which is often accused of being elitist, and it is one opera companies in the UK have been trying to solve. 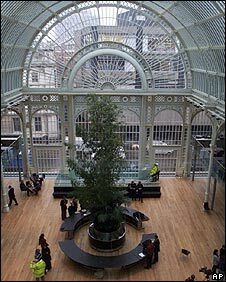 It is nearly 10 years since the Royal Opera House (ROH) re-opened its doors after its refurbishment. On average it is 5% short of a full house every night - with demand for a recent run of Carmen leading to a returns queue stretching around Covent Garden's block. Barry Stewart leads backstage tours at the ROH, one of several initiatives aimed at making opera more accessible. He agrees with Mr Cella: "It is very important for us to keep the momentum of our audience throughout the years. "Consider our traditional audience, well you have to make our new audience that traditional audience so through the years it is all about building up this audience." The ROH's building bricks include opera tickets with a starting price of £5, cinema link-ups and summer screens, which this year beamed live productions to 40,000 people at outdoor events around the country. 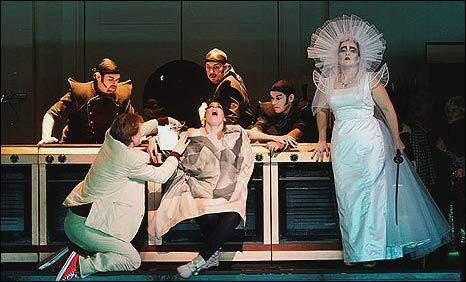 It's a similar story just down the road at the English National Opera's (ENO) headquarters. Like the ROH, ENO have slashed some of their ticket prices to open up the market. "We have over 2,300 seats here so it's really important to bring people in," says ENO chief Loretta Tomasi. "We do a range of work for all audiences because it is not about alienating existing audiences - that would be really stupid. But our core audience is very adventurous and they like to see different things being done." This has led to various high-profile partnerships. Film-maker Anthony Minghella directed Madame Butterfly for the ENO two years before his death in 2008. Theatre pin-up Rupert Goold has turned his attention to opera, directing this season's Turandot. However some of the audience grabbing initiatives fail to hit the mark, according to Opera Magazine's assistant editor Kate Molleson. "Opera should certainly be available to anyone who wants to see it. But trying to dumb it down so that it appeals to some sort of projection of what people think a younger audience might want is often quite an embarrassing prospect," says Ms Molleson. And Ms Molleson thinks there are still some barriers which need to be broken: "It's not the art form that is elitist but it is sometimes the industry that surrounds it. "It is also perhaps a problem more in this country than others where audiences are perhaps more representative of a certain demographic. That is something that certainly needs to be worked upon." Away from the opera houses opera singers have been embraced by the record buying public. Take this week's sales. Katherine Jenkins is dominating the classical album chart but she also has two albums in the main top 40. Take That's Gary Barlow is music's latest maestro to embrace the classical cross-over, making soprano Camilla Kerslake his first signing to his own record label Future Records. Her debut album is a mix of genres and includes a classically inspired version of Take That's Rule The World. "I wouldn't necessarily say the classical people are as open to it as the general public but nowadays it is a lot easier to cross over," she says. "In some ways it has been dumbed down. But it doesn't have to be pure. Good music is good music and if you are opening something up and creating an emotional response, making people feel and care about classical music when they normally wouldn't, well I don't think that is a bad thing." Opera Magazine's MS Molleson tends to agree: "What matters is the quality of what you are doing. I think people will buy your album or go to your concert if you are good and that's not to do with slapping a certain genre on it." Opera has been something TV audiences switched on to two years ago, when Paul Potts won the first series of Britain's Got Talent. Not surprisingly opera's audience pulling potential hasn't evaded TV producers. ITV1 is currently working on a new show following celebrities as they train to become opera singers. We'll find out who will be hitting (or not as the case may be) the high notes next year.